Where does the peace agreement in Najaf leave the Iraqi government, the Iraqi Shia and the country's uncertain progress towards stability and democracy? For the Iraqi prime minister, Iyad Allawi, there is relief but little celebration over the outcome of the standoff in Najaf. The agreement, after all, was not his doing, but came after the swift and unexpected intervention of the country's most revered religious leader, Ayatollah Ali Sistani. Indeed the resolution of the crisis exposes the limitations of what the Allawi government can do. Both the Americans and Mr Allawi had wanted to avoid the kind of unsatisfactory compromise which ended an earlier uprising by Moqtada Sadr's supporters in the spring. So in this crisis, Mr Allawi and his top ministers talked tough, threatening a military assault to remove Sadr's forces from Najaf's holy shrine. But when the assault never came, their credibility was dented. 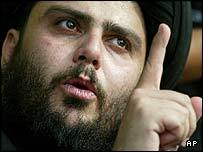 Now, once again, Moqtada Sadr's prestige has risen. Once again, he has walked free. Once again, he has refused to disband his militia. The Sadr movement may have the support of only a minority of the Iraqi Shia, but this crisis has shown it is a force to be reckoned with. So the Najaf agreement represents a truce, rather than a solution. It gives the government a breathing space, but little more. On the security front, Mr Allawi and the US-led multinational forces (as they are now officially described) still face a familiar mix of challenges. Sunni violence, centred on Falluja and other towns in the so-called Sunni triangle north and west of Baghdad, continues. So do the suicide bombings, the mortar and rocket attacks, and the drive-by shootings, temporarily eclipsed by the three-week drama in Najaf. The common feature of the anger driving different Iraqi groups, whether Sunni or Shia, is resentment at the US military presence in Iraq - and a feeling that the Allawi government is a puppet of America. Most violence appears to be home-grown. But Islamist fighters from outside the country still seem to be active. Responsibility for the recent, unsuccessful, assassination attempts against two government ministers was claimed by the militant Islamist group of Abu Musab al-Zarqawi. The Jordanian-born Zarqawi is a somewhat shadowy figure, considered an ally of al-Qaeda. Many Iraqi Sunnis and Kurds have shared the indignation of the Shia over American actions in Najaf. Night after night their television screens have shown death and destruction in the holy city. Among the non-Shia, Ayatollah Sistani's intervention may, however, trigger mixed feelings. Even if they share the general relief that the Najaf crisis is over - at least for now - Sunnis and Kurds may not welcome the new role being played by the country's most illustrious Shia cleric. 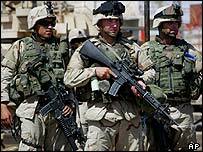 To some, his intervention suggests that the new Iraq will be less secular than the old. It also underlines that the days when the Shia were the underdogs, and the country was run by a Sunni elite, are well and truly over. As the authorities prepare for parliamentary elections due in January, plans for a new census are under way. The Shia are confident this will show they represent at least 60% of the population. Ayatollah Sistani insists the clergy should guide but not rule. Not everyone is reassured.